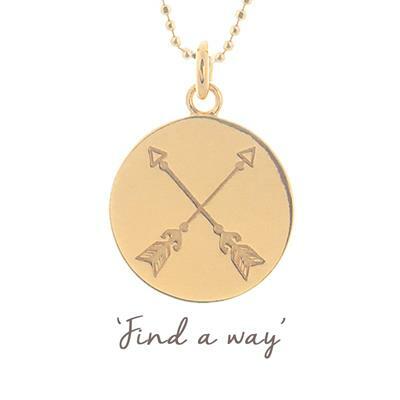 This gold-plated sterling silver necklace reminds and encourages us that we will always find a solution. The message spurs us on to dig deep, keep going, stay focused - until we find a way. The disc shows two crossed arrows, each pointing in different directions. This reminds us that there isn't only one way to do something, or one path to follow. This necklace was inspired by the remarkable story of Diana Nyad, who swam 111 miles across shark-infested waters from Cuba to Florida. She succeeded on her fifth attempt, at the age of 64, having made her first attempt at age 30. Determined that one day, she would find a way to succeed, she never gave up trying.